Recently brides have been asking for Passport Wedding Invitations and Save the Dates for Destination Weddings. Here is an example of a WEDDING PASSPORT we created using Carlson Craft Stationery. This Invitation was created for a recent Bridal Show we attended at the Kohl Mansion with Fanfare Wedding Professionals where we showcased the latest Stationery Designs to Bay Area couples and event planners. The above example of Passport Invitation illustrates Tiffany Blue Jacket Cover with Gold Foil Stamping and Thermography printing in Black ink. 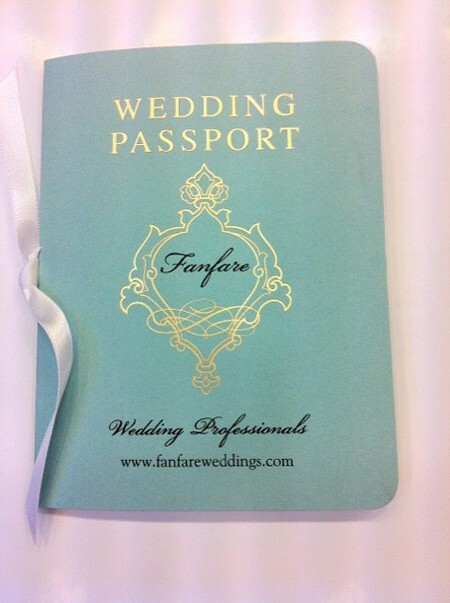 The Passport’s insert includes the Bridal Show details as well as a list of the Fanfare Professionals and Friends of Fanfare ~ The insert page is tied with a white-satin-bow. Similar Examples of Passport Invitations we carry at Hyegraph include Marsupials, Checkerboard and Arlene Segal, please see our website for more wedding invitation and save the date designs at www.hyegraph.com. If this is an idea you’d like to incorporate into your Wedding for Invites or Save the Dates please call, email or come in to our store. To shop online please visit our Shop Online Site. We also provide Digital Calligraphy Service for Envelope Addressing, Menus and place cards. For your Convenience we offer assembly, stuffing and mailing Service. Please contact us for assistance: in San Francisco 415-626-0461 or nationwide toll Free: 866-626-0461. We look forward to working with you on your next Special Event.